YANGON — Yangon’s Northern District court postponed making a final decision on the case regarding two detained Reuters reporters Ko Wa Lone and Ko Kyaw Soe Oo this morning, rescheduling announcement of the verdict for next Monday, as the associate judge U Ye Lwin has been on sick leave since August 24. The journalists were detained on Dec. 12 last year and have been facing an ongoing trial while incarcerated at Insein Prison since then. Their arrest came within half an hour of receiving a set of documents from police officers in Htauk Kyant on the outskirts of Yangon. A number of the officers had recently been transferred from northern Rakhine’s strife-torn Maungdaw Township to Myanmar’s commercial capital Yangon. The journalists were accused of possessing classified documents and charged under the colonial-era Official Secrets Act, which carries a maximum sentence of 14 years in prison. Dozens of journalists from both local and international news outlets arrived at the court around two hours in advance along with some diplomats including US Ambassador Scot Marciel and EU Ambassador Kristian Schmidt as well as other representatives from international organizations. 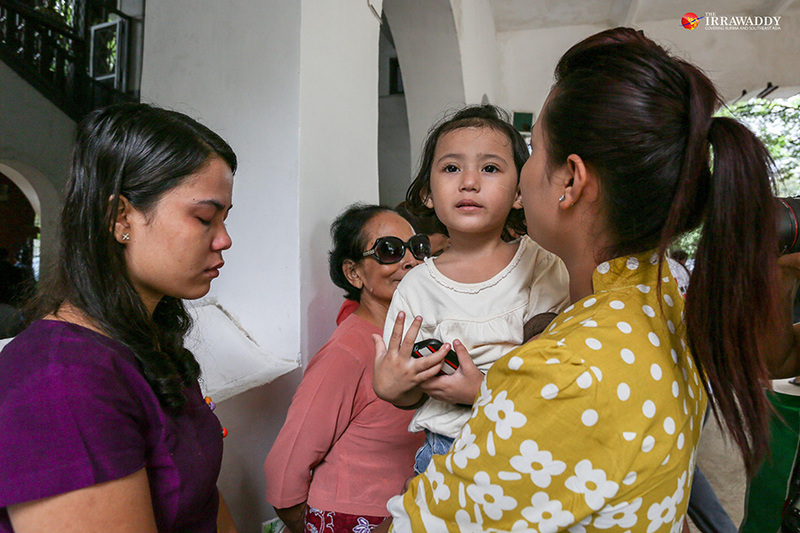 Soon after their arrival, a new male judge came into courtroom on behalf of associate judge U Ye Lwin and quickly announced that U Ye Lwin had been on sick leave since Aug. 24 and that the hearing is to be rescheduled for next Monday. “How can we know if the judge is really sick or not? On a positive note, he will have more time to consider the judgment he is going to make, said U Than Zaw Aung, one of the defense lawyers for the journalists. Regarding the verdict postponement, Human Rights Watch’s Asia Division, issued an urgent statement on Monday. Before the surprise arrest last December, the reporters were investigating a massacre, which took place in the Rakhine village of Inn Din where villagers, police and army soldiers executed 10 Rohingya men. In April, the army officially announced that seven soldiers had been sentenced to 10 years in prison with hard labor in a remote area of Myanmar for participating in the mass killing. The killings took place during the military’s crackdown on Rakhine State’s Rohingya communities following militant attacks on security outposts. The United Nations says the military crackdown has sent nearly 700,000 people fleeing to Bangladesh. The journalists’ defense lawyers say their clients were “trapped” by police in an effort to interfere with their reporting of a massacre of Rohingya Muslims. Moreover, a police captain Moe Yan Naing, who met with Ko Wa Lone and Ko Kyaw Soe Oo at Htauk Kyant on the night of their arrest, was initially listed as a key witness of the prosecutor but during the court hearing claimed that they had “set up” two reporters on the instructions of his superiors. The prosecutor announced Police Captain Moe Yan Naing a hostile witness and later the home affairs ministry announced he had violated police discipline and was dismissed from his position, receiving a one-year prison sentence. Although the government prosecutor claimed documents found in the reporters’ mobile phones were top-secret documents, defense lawyer U Than Zaw Aung pointed out that contents of the documents had been publicly announced in government newspapers previously. The hearings have been taking place since January. In total, 22 out of an initial 25 witnesses testified; three were removed from the list of witnesses, including Police Sergeant Khin Maung Lin, who was fired by the police and whose whereabouts have been unknown since May.